There has recently been a serious outbreak of measles, with over 100 confirmed cases across 10 states. I thought we should talk about the importance of having your children, and yourself, vaccinated for measles along with other infectious diseases. Measles and other infectious diseases are still common in some parts of the world. We often forget how serious these diseases can be, because we don't see them much anymore due to previously high vaccination rates. Childhood infectious diseases are no joke. They are serious infections that can be deadly. Prior to the introduction of the measles vaccine in the mid-1960s, there were 3 to 4 million cases of measles in the US every year, leading to about 48,000 hospitalizations each year, about 1,000 cases of brain damage each year, many cases of deafness, and a minimum of 450 deaths every year just from the measles. When vaccines were first developed, parents often stood in very long lines waiting to get their children vaccinated, because they knew how serious these infections could be. They had seen children die or have very serious complications which caused lifelong disabilities. They could not wait for their children to be protected. Through vaccination, measles had actually been totally eliminated in the US by the year 2000. Unfortunately, something very bizarre was happening around that same time. People started spreading fake claims that vaccines were bad for us. First they claimed that vaccines caused autism. Now that this claim has been thoroughly debunked by reputable science, their tactic has changed leading to other false claims about vaccines. The spreading of ignorant, false information puts all of our children at risk! The vaccination schedule is developed by the CDC, based on recommendations from the Advisory Committee on Immunization Practices (ACIP). The ACIP is a group of medical and public health experts that are carefully chosen based on the expertise in various fields of medicine, including vaccinology, immunology, pediatrics, virology, infectious disease, and other fields. Certain people are not considered for ACIP membership, including people who have any link whatsoever to a vaccine manufacturer. This committee meets three times every year and reviews all of the vaccine research and scientific data related to vaccine effectiveness and safety. Between the meetings, they work in groups all through the year to stay up-to-date on all of the latest research. The committee makes recommendations based on a wealth of scientific information, with consideration given to the safety and effectiveness of a vaccine when given at specific ages, the severity of the disease, and the number of children who get the disease if there is no vaccine. This is a rigorous process designed to protect the health of our children. One example of the great impact vaccines can have is the total eradication of polio in the US. Polio was once the most feared disease in America, causing death and paralysis across the country, with over 55,000 cases confirmed in 1952 in the US. Thanks to vaccination, there are no reports of polio in the US today. 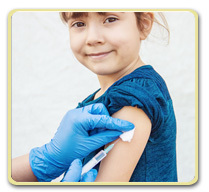 Vaccination is the best way to protect children from preventable diseases. Vaccines protect the children who get them, and their families. High vaccination rates in healthy children can also protect children who are still too young to be vaccinated or who are unable to get vaccines due to serious medical conditions. There is a high cost, both financially and medically, associated with vaccine-preventable diseases. As infectious diseases threaten to reappear, we should be vaccinating more, not less. If you would like to read more about vaccines, try this link. If you have any questions about vaccines, please log into your account and send us your question. We are here to help. 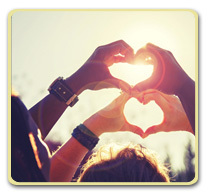 Since Valentine's Day falls this week, I thought the heart seemed like a good theme for this week's Health Tip. Here are a few interesting items about your heart that you might not know. Throughout your lifetime, your heart is about the same size as your fist. It grows at about the same rate as your fist grows. How long does it take for blood to get around the body and back to the heart? About once every minute and a half your blood makes a complete round trip through your body. That is about 1,000 times every day. When was the first heart surgery performed? In 1893, a prominent African American surgeon named Daniel Hale Williams performed the first cardiac surgical procedure in the US when he successfully repaired a tear of the outer layer of the heart. The answer is that chocolate can be both beneficial and harmful. Consuming chocolate in moderate amounts has been shown to be associated with a reduced risk of cardiovascular disease. Unfortunately, consuming chocolate in higher amounts actually cancels out the benefits, and then some, as a result of the higher sugar consumption. Dark chocolate does contain less sugar, so you can eat a little more dark chocolate than milk chocolate. Chocolate also contains a small amount of a cardiac stimulant, so for some patients, chocolate has been linked to a type of arrhythmia of the heart. Is there a link between your heart rate and how long you will live? There is actually abundant evidence that in all warm-blooded mammals, including humans, there is a link between heart rate and longevity. The higher your resting heart rate, the lower your life expectancy. Resting heart rate is most likely a result of both genetic factors and your lifestyle. Regular exercise for instance, typically causes your resting heart rate to decrease. There is a type of cardiomyopathy, Takotsubo syndrome, which is also called "stress cardiomyopathy" or "broken heart syndrome." This cardiomyopathy is a result of severe emotional or physical stress. Severe stress causes elevation of pro-inflammatory chemicals in the blood which significantly increase the level of inflammation in the body. Individuals who experience profound grief as a result of the loss of a spouse can have levels of inflammation high enough to cause heart damage. Holiday heart syndrome is an acute disturbance of the heart's rhythm which is linked to excess alcohol consumption. People often consume excess alcohol around certain holidays, leading to increased arrhythmias during or shortly after a holiday. Atrial fibrillation is the most common arrhythmia seen. The most common holidays associated with this condition are Thanksgiving, Christmas, and New Year's Eve. It does not appear to be linked to Valentine's Day. Does laughter benefit your heart? It is true that laughter is good for your heart. A hearty laugh can prompt blood vessels to expand then contract, which can increase your blood flow by up to 20%. That can promote healthy blood vessels, which can help to ward off cardiovascular disease. Laughter also helps to relax the whole body and trigger the release of endorphins. It can lower blood pressure, reduce stress hormone levels, and improve immune function. Sustained laughter is actually a good cardio workout. It gets your heart pumping and burns about as many calories per hour as walking at a slow to moderate pace. Laughter may really be the best medicine! If you have any questions about the heart , please log into your account and send us your question. We are here to help. Based on increasing objective data about the risks of high blood pressure, the guidelines for treatment of high blood pressure change every few years. You may recall a Health Tip that I wrote back in August about the most recent hypertension treatment guidelines, which recommended treating hypertension at lower levels than in the previous guidelines. Within the last several weeks, two important studies have been published, which give us even more information about the effects of high blood pressure on the brain. I thought this would be a great topic for our Health Tip this week, because it is such an important issue. 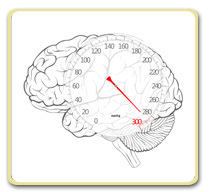 One study looked at the volume of gray matter (GM) in the brains of healthy young adults without diagnosed high blood pressure. This was combined data from 4 different cross sectional studies. They grouped the study participants into 4 groups based on their resting blood pressure (BP) levels. The first group had BPs below 120/80, and the last group had blood pressures greater than 140/90, with the other two in between. Overall, they found that young adults with elevated blood pressure were more likely to have lower GM volume in multiple areas of the brain. They noted that this effect was seen at a BP level starting at 120/80, worsening with higher levels. The researchers concluded "Our study shows that BP-associated GM alterations emerge continuously across the range of BP and earlier in adulthood than previously assumed. This suggests that treating hypertension or maintaining lower BP in early adulthood might be essential for preventing the pathophysiologic cascade of asymptomatic cerebrovascular disease to symptomatic end-organ damage, such as stroke or dementia." The other study evaluated the effect of intensive BP control on the risk of cognitive decline and dementia. This was a large study done over 5 years, with 3 years follow up afterwards. The participants were 50 or older and had hypertension, but not diabetes, or history of stroke. They randomly assigned them to two groups: one with intensive treatment, with a goal of a systolic blood pressure of less than 120, and the second to the standard of treatment at the time of the start of the study, with a goal of a systolic pressure of less than 140. They found that intensive blood pressure control significantly reduced the risk of mild cognitive impairment, as well as the combined rate of mild cognitive impairment or probable dementia. When they measured the incidence of probable dementia alone, although there were more cases in the standard group than the intensive treatment group, the difference was not statistically significant. The lead researcher stated "We hope to have guidance, based on this and subsequent studies that will more definitively show how to slow or even stop dementia well before symptoms appear." These two studies give us important information about the risks that high blood pressure poses to the brain and its function. This information underlines the importance of screening for high blood pressure at a young age, as well as the importance of good blood pressure control if you do have high blood pressure. If you have any questions about the effects of high blood pressure, please log into your account and send us your question. We are here to help.